Elizabeth (from the Occidental Idiot) and I have been trading writing prompts, and her latest for me was: Food... What are some ways it's more than nutrition? What is the significance of making and sharing food (for you)? I’ve actually just baked, so I think that I’m in a pretty good mind-frame to answer the question. Or perhaps just to get started on the topic, and share a recipe in the process. Let’s start with food. Of course its obvious purpose is as fuel for the body. It’s what provides your body with essential nutrients and energy to stay alive. But what is it besides and beyond simply nourishment? Food is a joy, when it is well prepared. It’s a delicious taste, pleasure on the tongue, a wonderful feeling in the belly. It’s the aroma of cooking, stewing, melting, and freshly-split-open fruits of the earth. It’s savory, sweet, bitter, sour, creamy, vinegary goodness. In short, it’s delight. But beyond just the experience of eating, food is about community. Whenever food appears it brings people together for enjoyment and meeting of needs. It also signifies time and energy and purpose: someone prepared the food. I prepare food for many reasons. To feed myself, for stress relief, to share and provide for others, and to amuse myself. I love baking, especially. There’s something about the smell of spices in the air, the challenge of trying a new recipe, the process of kneading and shaping and getting traces of vanilla under your nails or worked into you skin so that later in the day, you still smell like a delectable concoction. It’s not entirely sensible, but it completely engages the senses. It is primal, pleasurable, care-giving and art-making. It is therapy, it is natural, and it is a way to relate to people. Of course, gathering and eating with friends, family, or even strangers is necessary to the food experience as well. The intimacy of a table and the act of eating often lead to surprising interactions and compatibility. Discussions held over the dinner table have a special place in my memories – as a definition of true communication and affirmation of group status. A long meal is basic to social interaction in many cultures, and it’s easy to see why: people let their guards down at mealtimes, and open up their mouths – for conversation and consumption, both. I could go on, but I think I’ve said enough, or at least exhausted my store of flowery words for the day. The only thing left is to declare that I AM A GENIUS. Err…not really. But temporarily, in the specific context of how my fruit tarts turned out today, I am. Lately I seem to bake by the seat of my pants. By this I mean that I look in the refrigerator or pantry and take an inventory of ingredients I have available, and then I find a recipe (or make one up) to match. 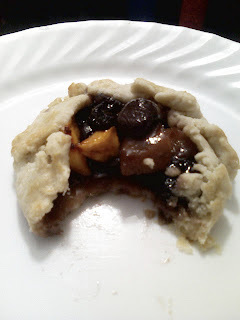 I had fresh black cherries and peaches available, so I looked for a cherry and peach tart recipe. Then I elaborated and embellished. Behold the end result. Let cherries sit in bowl until juice collects. I pitted the fresh cherries and then froze them in a plastic container, defrosting when I needed them for the recipe. I collected approximately 1/2 cup cherry juice. Mix juice, 1/4 cup sugar and ½ cup water in small saucepan over medium-low heat. Add chopped apples and simmer until tender. Remove apples but continue to simmer juice. Combine apples, cherries, peaches, 1/2 cup sugar, flour, and pumpkin pie spice; toss to mix. Prepare Pastry. 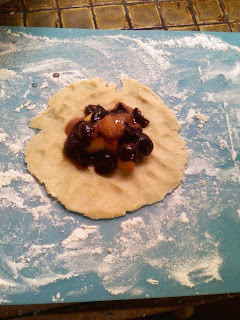 Divide pastry dough into 8 equal portions. On a lightly floured surface roll or hand shape each dough portion into a 7-inch circle. Place on a foil-lined, very large baking sheet. Place about 3/4 cup filling in center of each circle, leaving a 1 1/2-inch border. 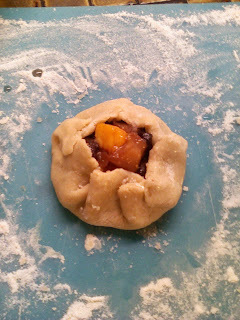 Carefully bring up edges over filling, pleating as necessary (dough may crack). Brush edges of each tart with egg white and sprinkle with remaining sugar. Remove cherry juice (now a glaze) from heat. Bake tarts in a 350° oven for 40 to 45 minutes or until golden brown and centers are bubbly. Pour 1 teaspoon of cherry juice glaze over each tart. Cool on baking sheet on wire rack about 30 minutes. In a large mixing bowl combine 2 1/2 cups all-purpose flour, 1/4 cup sugar, and 1/2 teaspoon salt. Cut in 1 cup cold unsalted butter until mixture resembles cornmeal. In a small bowl combine 3 tablespoons cold water and 1 teaspoon vanilla; drizzle over flour mixture. Toss with a fork until mixture holds together. If necessary, add up to 1 tablespoon more cold water. Gather into a ball. Cover and chill for 1 to 2 hours or until easy to handle. Warning: this recipe is extremely delicious, yields a beautiful product, will make your kitchen smell like heaven, and induce envy in all your friends and neighbors. Watch your back – they’ll want those tarts! I'm going to go and make some pastries now. That looks delicious! If I was more of a baker, I'd definitely try it. I love to cook, not much into baking but I think I'm going to try these out. Thanks! Those tarts look so yummy! Really great post! Anything with cherries and peaches makes my belly happy. Looks delicious. I love reading about how food plays into our sense of community and social interactions. It truly is the ultimate human bonding experience. i am so jealous. you're like a mind reader. but i've already told you you're awesome. cause you are. anyway. hope mom isn't wearing you out too much. you're required to bake here at home. I love your scrolling pictures capturing each step of the process. I am in love with the asparagus risotto I've been making lately. Yum! that looks sooo delicious. and with your pics easy to do. thanks for the recipe. i'll have to get my hubby to make some with the fresh summer berries available these days.